I've been getting a lot questions about my ears. Some people even think my ears were involved in some kind of accident. Well I can assure you, nothing terrible has happened with my ears. I was simply born this way. Also I can hear perfectly clear ;-). I can even hear my humanz open a bag of snackies in the other room! 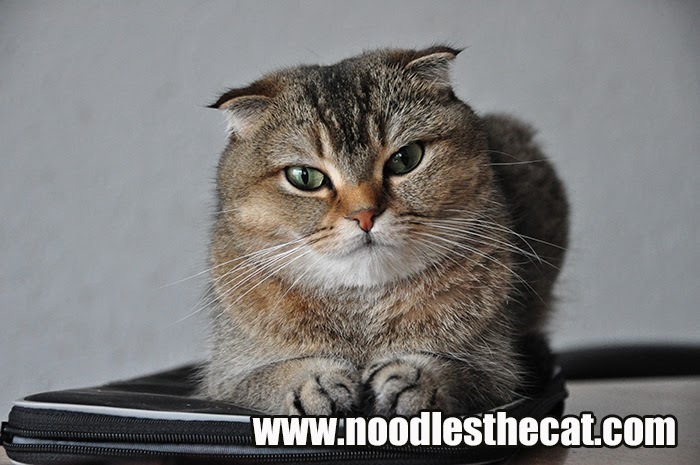 Scottish Folds can have straight or folded ears. That sounds a bit strange, right? Well let me start at the very beginning of the Scottish Fold. The original Scottish Fold was a white barn cat named Susie. She was found at a farm near Coupar Angus in Perthshire, Scotland, in 1961. Susie's ears had an unusual fold in their middle. Two of her kittens were born with folded ears and one of them was taken by William Ross. He was a neighbouring farmer and cat-fancier. With the help of geneticist Pat Turner they started a breeding program. It produced 76 kittens in the first three years. 42 kittens had folded ears and 34 kittens had straight ears. They concluded that the ear mutation is due to a simple dominant gene. All Scottish Folds share a common ancestry to Susie. So now you know that some Scottish Folds have folded ears and some have straight ears. They are commonly known as Scottish Straights. The most famous one is Maru. You know the cat who loves jumping in boxes on Youtube.com. I've been told that osteochondrodysplasia (OCD) is causing the folded ears. OCD can affect cartilage and bone development throughout the body. So if you ever want to get a Scottish Fold you should always get one from a responsible breeder. Every responsible breeder knows that you CAN'T mix two Scottish Folds or Straights together. The chance of cartilage and bone development problems will be much higher and we all want our cats to be happy and pain free. Well at last I feel in the know! And you make a good point about making sure your breeder is responsible..... for this and so many other reasons!